On the travel calendar of my life, 2016 has claimed a prominent spot. While it isn't the year I visited the most countries (that would be 2014) or even the most new countries (also 2014), it is the year I spent most of my time outside the land of my birth. In total, I was only in South Africa for about three and a half months of 2016 -- by July, every day that passed was the new record for the longest I'd ever been away. Looking back, 2016 blessed me with some incredible days and moments while travelling. In addition to experiencing Qatar as a resident rather than a tourist, I visited Morocco and Oman for the first time, and was able to return to Dubai for two busy but incredible weekend trips. If you're looking for new places to explore in 2017, or are curious about what moments or activities were the highlight of my trips, read on. I almost didn't pack a coat for my trip to Marrakech... it was winter, sure, but it surely wasn't that cold? Fortunately my just-in-case spidey senses kicked in, and I was able to comfortably venture out in the remains of a snowfall that arrived the week I visited Morocco. I grew up in a country where snow is a rare occurrence, so stepping out of my tour bus to see the Ourika Valley frosted in white was an unexpected joy. I crunched along mountain paths, passing in front of houses where children were scooping up handfuls of ice to throw at their siblings. The sky was an impressive blue, playing the part conveniently for my awed snaps of the green and white landscape. Rivers flushed with meltwater wound across the road, as prickly pear plants stood juxtaposed against the wintry landscape. 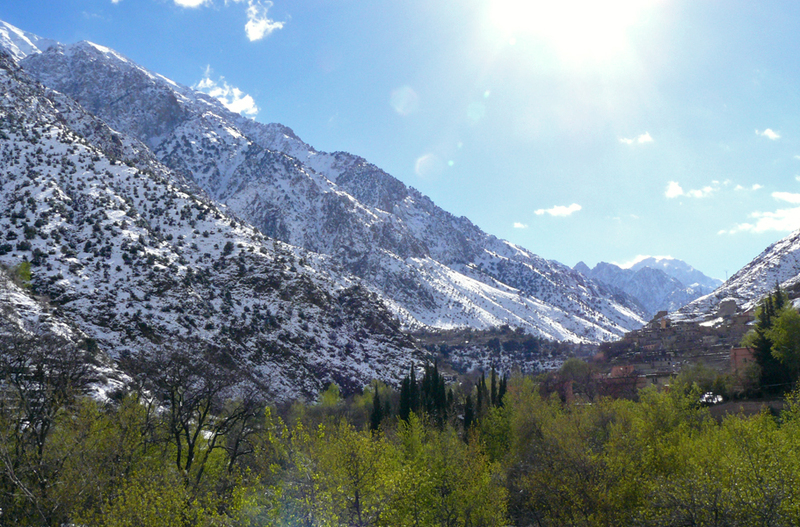 Later on my trip, I was able to travel further into the mountain range, and witness the snow-covered peaks and valleys nearer to the highest point in the Atlas Mountains. Motoring along narrow, convoluted mountain passes was simultaneously magical and slightly terrifying, as the cars and busses hurtled along at top speed regardless of the icy roads. With steep drops and flimsy barriers to mark the edge of the cliff, it was a treacherous and thrilling way to explore the landscape. But oh, the view. While there is never a shortage of culinary options in Doha, having so many restaurants, street food vendors and artisan chefs on hand at the annual Food Festival is never a bad thing. This year's event was held in three venues, allowing me to split my visits and explore what was on offer on multiple days. The most photogenic venue had to be the beach-side food truck park, located in the Venetian-style Qanat Quartier on Qatar's best known man-made island, The Pearl. Eating strawberry cheesecake-flavoured ice cream next to gorgeous pastel buildings, before taking a walk on the beach, is a winning formula. The main festivities took place on the sprawling lawns in front of the iconic Museum of Islamic Art, and the organizers went all out. There were live cooking stations and a myriad of food stalls separated by the type of cuisine on offer. This is where I tasted my first "no meato" burrito and sampled the fare on offer by the country's first vegan cafe, all while watching the changing lights of the skyscrapers across the bay. I have enthused about my trip to Oman previously (how is this country not more of a tourist hotspot? ), so it's not easy to pick just one moment to share. Watching the sun set over Muttrah from the balcony of a luxurious Omani restaurant was memorable, as was eating pomegranates while perched on the edge of a mountain top. Oh, and snorkeling among eels and coral reefs after seeing pods of dolphins jump alongside the boat. You know, totally normal for a Sunday. A stand-out moment was venturing out of Muscat with just a rental car, a sometimes unreliable GPS and a vague sense of the route to take. 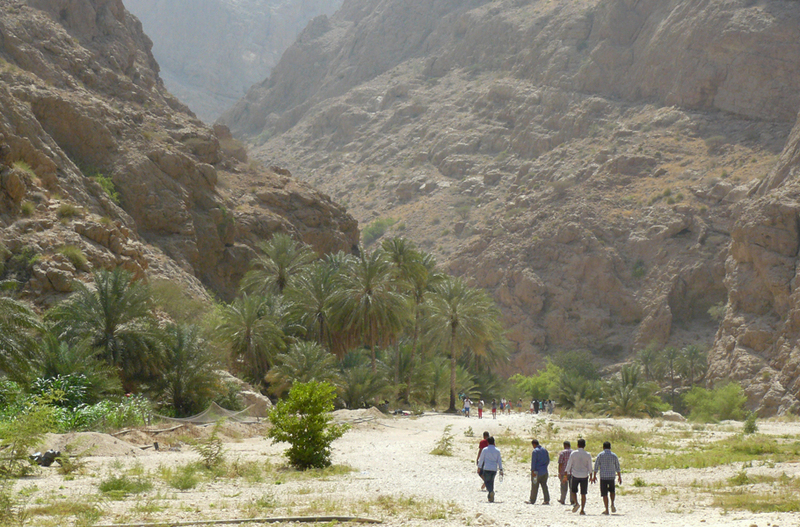 The road to Bimmah Sinkhole, Wadi Shab and Sur was long and twisted. It ran across red earth with sparse shrubbery, into dark jagged mountains and across bridges that spanned wide chasms. While the sinkhole is located in a gated park less than 5 minutes from the parking lot, the hike to Wadi Shab was more challenging, especially in the September heat. I was mostly preoccupied with putting one foot in front of the other without falling off into the river below, but the walk to the mountain pool was also punctuated with stops to admire the scenes that surrounded me. There were jovial hikers carrying bags and pots filled with food for their picnic, deep gorges lined with rising walls of rock and valleys filled with green crops and palm trees. It's a scene that has stayed with me long after I left the country. Having survived my first full summer in the Gulf (hint: it mostly involved hugging an air conditioner), all I wanted to do on my late autumn trip to Dubai was be outside. Preferably somewhere pretty and walkable, so I could experience the simply joy of seeing the city on foot. The Walk at Jumeirah Beach Residence (JBR) ticked those boxes. We set off with a general idea of where we wanted to go (I'd been told there was a beach), hopped off the metro and emerged in Dubai Marina. After a photo stop to capture the speed boats careening around in the water in front of a nest of skyscrapers, we slowly made our way towards the rumoured beach. Just as the sun began to set, we discovered it, sneakily hiding behind some construction sites. Of course, we later realized we had not entered the main section (filled with lavish curtained loungers and umbrellas), but following an unknown path and uncovering a beach at sunset was much more fun. As the sky darkened, JBR came alive with a night market, carousels, street food vendors and a range of artfully lit restaurants and stores. We happened upon the most gorgeous coffee shop (The Brass), which made all my dairy-free coffee dreams come true by offering a choice of not only soya and almond milk, but freaking coconut milk to complete my cappuccino. I ate incredible vegetarian curry at a restaurant overlooking the beachfront, and then sat on the grass watching the crowds while sampling a takeaway peanut butter cheesecake. You won this round, Dubai. Thank you, dear reader, for following along with my journeys this year... It's been wonderful to share the often unexpected, beautiful places I've visited with you. I hope your new year is filled with many opportunities to explore the countries, cultures and landscapes that make our blue planet such an incredible place.